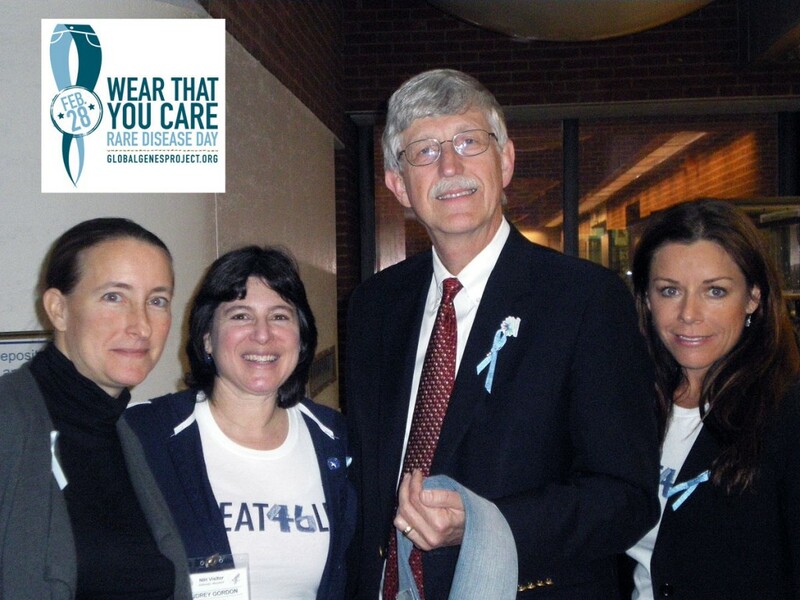 The Global Genes Project, a rare disease patient advocacy organization, was invited to present a giant handmade denim genes ribbon to Dr. Francis Collins on February 28 — Rare Disease Day 2011. This year the NIH Office of Rare Disease Research (ORDR) encouraged everyone to wear jeans to show support for the campaign of using a genes and jeans concept to educate the public on the prevelance of rare genetic diseases and the lack of available drug treatments. I was invited to speak at Pfizer in Boston about Niemann Pick Type C disease and our medical odyssey over the past three years getting FDA approval to treat Addi and Cassi with a potentially life-saving sugar compound called cyclodextrin. I wish I could have been in two places at the same time. I would have liked to meet Dr. Collins to thank him for supporting our campaign and to find out more about the NIHs plans for the National Center for Advancing Translational Sciences (NCATS). Apparently, the National Institutes of Health’s Scientific Management Review Board (SMRB) recommended that the NIH open a new center this fall in an effort to spur creation of medications for rare diseases. Read the SMRB report here. Collins says that the NIH is not going to turn into a “drug-development company” but will move research forward so it will be more attractive to commercial investments. With fewer than 200 of 7,000 rare diseases have any available therapies creating a center like this at the NIH is long overdue. It’s encouraging that the Director of the NIH is taking action and recognizes the seriousness of the problem we have with drug development for rare diseases. I hope the strategy works because it’s the only chance for millions of rare disease patients to have treatments developed to save their lives. I have to admit this one with you. This is not what I usually do! I like to read, it will make people think. In addition, let me say thanks in my heart!